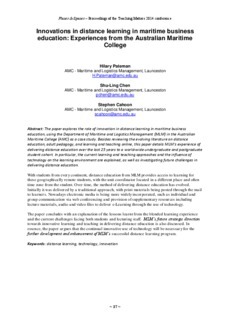 The paper explores the role of innovation in distance learning in maritime business education, using the Department of Maritime and Logistics Management (MLM) in the Australian Maritime College (AMC) as a case study. Besides reviewing the evolving literature on distance education, adult pedagogy, and learning and teaching online, this paper details MLM’s experience of delivering distance education over the last 25 years to a world-wide undergraduate and postgraduate student cohort. In particular, the current learning and teaching approaches and the influence of technology on the learning environment are explained, as well as investigating future challenges in delivering distance education. With students from every continent, distance education from MLM provides access to learning for these geographically remote students, with the unit coordinator located in a different place and often time zone from the student. Over time, the method of delivering distance education has evolved. Initially it was delivered by a traditional approach, with print materials being posted through the mail to learners. Nowadays electronic media is being more widely incorporated, such as individual and group communication via web conferencing and provision of supplementary resources including lecture materials, audio and video files to deliver e-Learning through the use of technology. The paper concludes with an explanation of the lessons learnt from the blended learning experience and the current challenges facing both students and lecturing staff. MLM’s future strategic direction towards innovative learning and teaching in delivering distance education is also discussed. In essence, the paper argues that the continual innovative use of technology will be necessary for the further development and enhancement of MLM’s successful distance learning program.